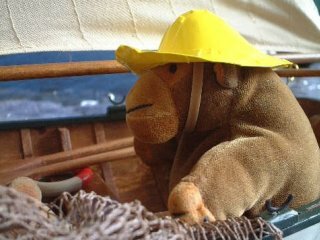 "I don't see why we can't just go to the shop"
Mr Monkey wears his sou'wester whenever Mr Cat's cravings for fresh fish grow too loud, and the weather looks grim. 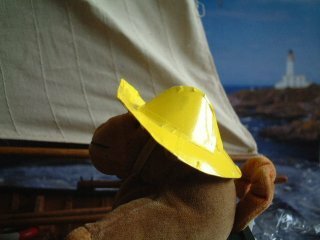 Mr Monkey's sou'wester was constructed by cutting up a bag intended for gifts, and rearranging the bits. It's held on with a bit of elastic band.